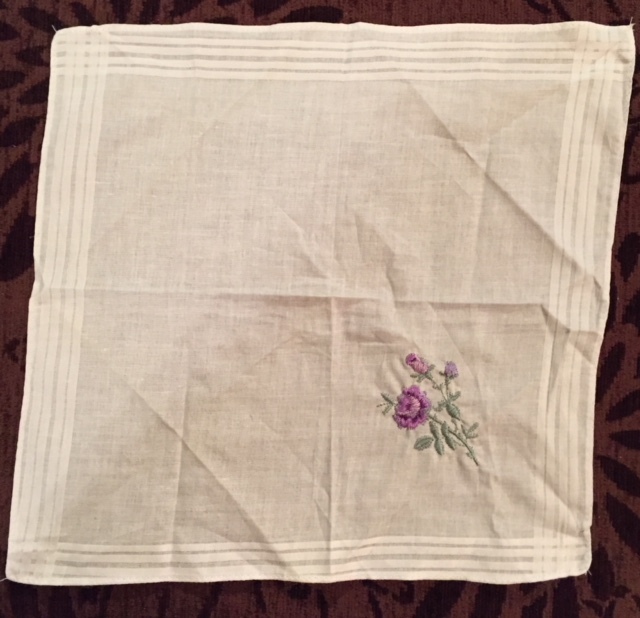 Le Blog de Frivole: Hanky Choice and Valentine! Thank you for your comments on the previous post. The variegated purple turned out more popular than expected but although the colours matched really well, I was unhappy with the look of variegated for this project. The other choice that got most votes was the bluer green which I think matched best of the two greens so that's what I went with (although I did hesitate for quite some time and ended up working too much of both before I made up my mind!). I'm finding it very relaxing to work this one shuttle edging and am making good progress. but it was taken in the evening with poor lighting. However, when examining my hanky to check how many repeats I needed for each side, I noticed how badly hemmed it was... Look at that. It's all crooked! The hem is not even lined up with the woven lines in the fabric. So I decided to undo the hem, cut the fabric where necessary and re-hem so that it has four straight and matching sides. I made nice little mitered corners and hand-stitched the hem. Yes, that's better. so I'd like to wish a Happy Valentine's Day to everyone! Beautiful hemming! The edged hanky certainly deserves it! Happy Valentine's Day to you too! Hanky finishing is gorgeous as is the edging! I might give that one a go! It’s really pretty . Glad you could sort the hankie out, it would be a shame to put the edging on a wobbly edge. Your new hem looks wonderful... well worth the extra effort! Ein schöner Saum ist es geworden. DDer Aufwand lohnt sich. Bin schon auf den fertigen Occhi-Rand gespannt. Wow! Talk about "attention to detail"! I am a type A personality also, and it does bother one when things aren't even :) looks perfect now though.....and beautiful tatting!!!!!!!!!!!!!!!!!! Thank you very much for your comments tatters! I finished the hem a couple of days ago and will show you photos very soon. Hi Shirla, I can't say I have a particular technique as such... I always start partway down one side, then work the first corner. There is some flexibility with tatting, especially some with bare threads as you can stretch it a bit to fit. If it really doesn't fit, I will improvise an extra element if necessary or change the stitch count a bit as I'm nearing the next corner and can see how the design will fit along the edge. Not sure if that helps, but that's how I do it! 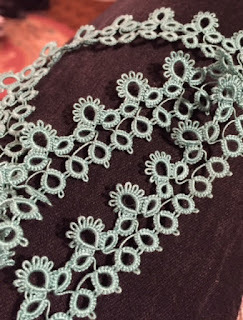 Or else, you can actually tat one repeat of your chosen edging, measure it and then see how many you'd need for your hanky side and make adjustments before you start tatting by making longer or shorter joining picots for example or by adjusting the stitch count or the number of elements.